We’d love your help. Let us know what’s wrong with this preview of Losing Control & Liking It by Tim Sanford. To ask other readers questions about Losing Control & Liking It, please sign up. 1) You live and die by your own choices. 2) You can choose smart or stupid. 3) There's always somebody or something whose job is to make your life miserable if you choose stupid. Whew! Big exhalation of breath as I stepped away from my kids over and over, watching to see which they would choose, knowing that I would oftentimes be that 'someone' whose job it was to take on #3. Since finishing this book, I've found myself tempted to grab things when I really need to just fold my hands and let my child(ren) handle their own stuff. It's a scary world out there and I want so much to protect my kids from harm. But at a certain point, that's not my job. It's their choice, and my role as their prayer warrior grows proportionally. I appreciated the chapter on Intervention: When You Have To Step In. Far too often, parents feel at a loss as to where to go when things get really crazy. This was a helpful list. I bought this book about parenting teens, knowing I'd have one in a couple of months, but I read it wondering whether or not to allow giving up an enjoyable activity with undesirable components. I'd rather the near-teen put up with the minor negatives to enjoy the good. I didn't really find an answer to that specific question, which is essentially when and how much to relinquish control, little by little. This book is mostly about parenting teens with some serious problems, but does talk about k I bought this book about parenting teens, knowing I'd have one in a couple of months, but I read it wondering whether or not to allow giving up an enjoyable activity with undesirable components. I'd rather the near-teen put up with the minor negatives to enjoy the good. I didn't really find an answer to that specific question, which is essentially when and how much to relinquish control, little by little. This book is mostly about parenting teens with some serious problems, but does talk about keeping relationships healthy. The 3 Rules of Life may apply, but this child does not tend to do the "stupid" things of Rule 2, but is honestly trying to do the best possible. In fact, to think of things in terms of "stupid" or "smart" may be offensive. For most of these situations, it may be wiser for us to think of them as "good" or "better" or "best." The four interpersonal styles were interesting - HOLD, GRAB, TOSS, and FOLD. Mostly, we fall into the hold and fold categories - the healthy one - but if I don't think the near-teen's HOLDing very wisely, then it does become HOLD and GRAB. This book made me keep thinking of my Aunt Cynthia's question for her own teens, as well as me during my teen years, "What are YOU going to do about it?" putting the responsibility for the problem on the right person. In our family, the statement is generally (to the child), "It is/was YOUR job to ..." remember your lunch or study for your test, or talk to your teacher or whatever. If possible, these things are said with an empathetic hug or shoulder pat, but at least eye contact in order to try to make them still feel loved. The 3 Habits of Highly Controlling People is a section that we may need to work on. The 3rd - correcting wrongs of our own childhood, doesn't really seem to apply. The 2nd, worrying, I have a different solution for, which I use when I think of it. I honestly think that the author's solution would only annoy me. There have been times, when frustrated or worried, that it's been good to sit still and listen to my own heartbeat, and to realize that it's not so bad, that I'm still alive. That may be the sort of thing the author is tending toward with his in-the-moment type of thinking. But, I prefer to pray and release whatever I'm worrying about - even if I have to do it multiple times, even multiple times a day. Then, I "listen" in my daily Bible readings to see if there's any part I have in minimizing whatever it is that I'm worrying about. God is good to "talk" us through our problems like that, or give us hope in the middle of them. The first habit, "Should" thinking, I have a theological issue with. The wisdom books of the Bible are written in "want-to" format, telling us the good things that happen when we choose wisely. But, there are some definite rules like the 10 Commandments, which are worded even stronger than "should." The danger Tim Standford lists for the "should" statements is condemnation. Well, that's true. Breaking the 10 Commandments brings real condemnation from God Himself, but Jesus offers real forgiveness and peace. The condemnation doesn't have to be a long-lasting state, but a momentary one, when peace with God is sought. Tim Sanford’s book, Losing Control and Liking It, is written for a very small audience: parents of older teens who are having a hard time letting them go. When we home schooled years ago I read many books that implied that with the right tools I could turn out children who were “practically perfect in every way”. Well, guess what? We did everything the books said and our kids still disappoint us at times (and we still love them when they do.) But what a relief to read Sanford’s book which states Tim Sanford’s book, Losing Control and Liking It, is written for a very small audience: parents of older teens who are having a hard time letting them go. When we home schooled years ago I read many books that implied that with the right tools I could turn out children who were “practically perfect in every way”. Well, guess what? We did everything the books said and our kids still disappoint us at times (and we still love them when they do.) But what a relief to read Sanford’s book which states that my job as a parent is not to turn out perfect kids who make perfect choices. In fact, Sanford writes that a parent’s main job is to (1) validate and (2) nurture his children. By giving the child a firm foundation of knowing he is noticed, loved and enjoyed, the parent can teach (by words or modeling) how to make wise choices. As a child grows into an adult the parent should be making less and less decisions for him. If he’s done his job of nurturing, validating and teaching, he is able to release the reins of parental control. “Your teen is moving away from your hands-on guidance to your hands-off availability.” (p.38) Sanford says that although we can no longer control the actions of our young adults, we can continue to influence them. What I liked about this book: the reminder that it is not up to me to make sure my children turn out 'okay'. The chart that neatly summarized the styles of interaction between parents and teens: folded hands, not taking responsibility for someone else's problems; closed hand, holding on to one's own responsibility; flinging hand, trying to toss one's problems on to someone else; and the grabbing hand, trying to take over what is not theirs to control. I liked his comments about the futility of w What I liked about this book: the reminder that it is not up to me to make sure my children turn out 'okay'. The chart that neatly summarized the styles of interaction between parents and teens: folded hands, not taking responsibility for someone else's problems; closed hand, holding on to one's own responsibility; flinging hand, trying to toss one's problems on to someone else; and the grabbing hand, trying to take over what is not theirs to control. I liked his comments about the futility of worry and the role of free will. Focus On The Family featured this book. There is lots of time to read and rethink the ways you relate to people you love the most especially your teenagers. At first, the title made me uncomfortable. In a simple format that includes some graphs and charts, Part 1 has the first chapter title of Control: It's Not Your Department. Part 2 has a chapter on Three Habits of Highly Controlling People. Part 3 is entitled Turning Off The Power Struggle where the reader finds that the purpose of this book Focus On The Family featured this book. There is lots of time to read and rethink the ways you relate to people you love the most especially your teenagers. At first, the title made me uncomfortable. In a simple format that includes some graphs and charts, Part 1 has the first chapter title of Control: It's Not Your Department. Part 2 has a chapter on Three Habits of Highly Controlling People. Part 3 is entitled Turning Off The Power Struggle where the reader finds that the purpose of this book is to practice the difference between control and influence. For parents who are still trying to control their grown up teenager through the deeply embedded habit of worry and the need to feel better through controlling them to get them to turn out alright. This little gem may be all you need to navigate the family turbulence called adolescence! Sanford's "Three Rules of Life" are timeless reminders of our choices and consequences, as well as our ultimate lack of control over our emerging teens and young adults. In addition, Sanford provides other helpful insights into "losing control," such as detailed descriptions of healthy and unhealthy parent-child relational dynamics and specific case studies. This book will point out where you are trying to control your teen, make you understand why it won't work, and then it will give practical, healthy alternatives. There may be nothing new under the sun, but Tim Sanford presents the truths of wise parenting in a new (and humorous) light. I read this in one day, used a pencil to mark important points, and plan to open it often as I adopt some new ways of relating to my teens. Excellent. 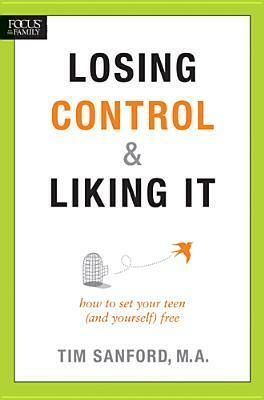 Excellent advice - not just for parents tempted to control their teens - but anyone who finds themselves tempted to control other relationships. Some helpful day-to-day advice, how to reprogram your controlling habits. While there were many examples of real life scenarios, of course I wish there had been more, the book seemed a little slim and bare-bones.